The Brooks Group provides an array of “Mergers & Acquisitions” (“M&A”) advisory services. 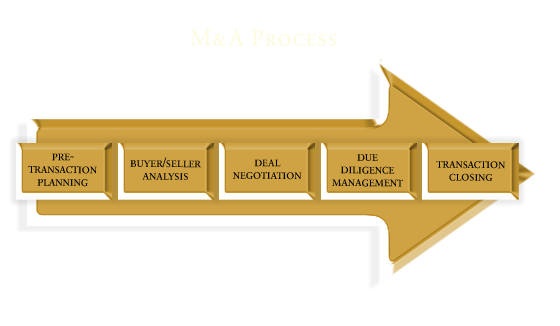 These services include expertise in all phases of the “M&A” transaction process. From the Pre-Transaction Planning phase to the Transaction Closing phase, The Brooks Group offers a team of experienced professionals who have been involved in numerous transactions over a broad spectrum of industries. For some clients, their service needs may be focused upon requiring our firm’s expertise with only one particular phase of the “M&A” process (such as Buyer/Seller Analysis or Due Diligence Services). In other cases, The Brooks Group may be brought in by a client to “quarterback” the entire “M&A” process “from start to finish”. Whatever the required role may be for a particular client, The Brooks Group is positioned to work with them to achieve their tactical and strategic objectives.